Se7en meets The Silence of the Lambs in this dark and twisting novel from the author Jeffery Deaver called, "A talented writer with a delightfully devious mind." For over five years, the Four Monkey Killer has terrorized the residents of Chicago. When his body is found, the police quickly realize he was on his way to deliver one final message, one which proves he has taken another victim who may still be alive. As the lead investigator on the 4MK task force, Detective Sam Porter knows even in death, the killer is far from finished. When he discovers a personal diary in the jacket pocket of the body, Porter finds himself caught up in the mind of a psychopath, unraveling a twisted history in hopes of finding one last girl, all while struggling with personal demons of his own. With only a handful of clues, the elusive killer's identity remains a mystery. 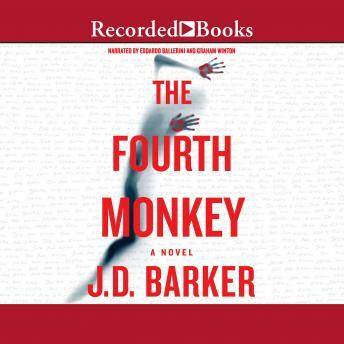 Time is running out and the Four Monkey Killer taunts from beyond the grave in this masterfully written fast-paced thriller. His was a decent audiobook. The narrator did a good job, although I dislike when they constantly add superfluous stuff like, “billy shrugged and said”. A new favorite read of the year for me. This crime thriller is very fast paced and entertaining. Many surprises that I didn't see coming. Multiple point of views, including a dairy from the Fourth Monkey Killer. I'm glad I didn't read too many reviews before reading the novel. It can so easily be spoiled.